It is widely recognised as an essential text of international relevance, for students and practitioners alike. I highly recommend it to the new generation of activist-scholars in the field." Lucy Gilson, Professor of Health Policy and Systems, University of Cape Town, South AfricaPart of the Understanding Public Health series, this bestselling book is the leading text in the field. 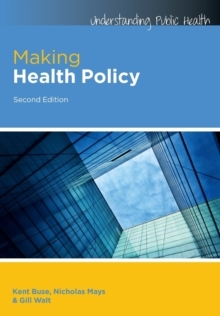 It focuses on how health policy is made nationally and globally, clearly explaining the key concepts from political science with a wide array of engaging examples.This edition is fully updated to reflect new research and ways of thinking about the health policy process. Written by leading experts, this clear and accessible book addresses the "how" of health policy making in a range of international settings.The book provides an accessible approach to understanding: Health policy analysisPower and policy makingPublic and private sectorAgenda settingGovernment roles in policyInterest groups and policyPolicy implementationGlobalization and policy processPolicy research and evaluationDoing policy analysis Making Health Policy 2nd edition is an ideal resource for students of public health and health policy, public health practitioners and policy makers.Understanding Public Health is an innovative series published by Open University Press in collaboration with the London School of Hygiene & Tropical Medicine. It provides self-directed learning covering the major issues in public health affecting low, middle and high-income countries.Series Editors: Rosalind Plowman and Nicki Thorogood. "This book is excellent and unique in the way it addresses complexity within the field of global health and policies in a simplified and practical way. Each chapter is structured to include Activities and Feedback, which fosters reflection and adult learning. This approach makes the book ideal for teaching at all levels of university. I highly recommend it. "Goeran Tomson, Professor of International Health Systems Research, Karolinska Institutet, Sweden"This is an excellent and accessible introduction to the politics of health policy-making by three of the world's leading scholars on the subject. If anyone thinks that improving the health of a population is solely about getting the interventions and policy content right, this book will surely disavow them of that belief. Political dynamics matter, and the authors draw on the most up-to-date research to provide practitioners and students with clear, sensible, evidence-based guidance on how to manage these dynamics. "Jeremy Shiffman, Associate Professor of Public Administration and Policy, American University, USA. 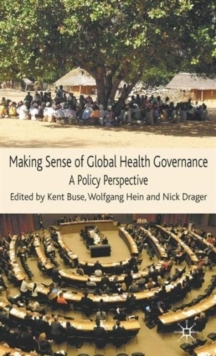 "Making Health Policy is a must-read for those studying and working in global health. It provides a unique introduction to core concepts in global health policy and brings politics to the core of public health. Why do some issues get more attention than others? Why is evidence-based policy-making so difficult? How can we understand and study power in the health system? This book provides answers to these crucial questions. "Devi Sridhar, James Martin Lecturer in Global Health Politics, Oxford University, UK"Having used the earlier edition of this book, I would highly recommend it. The book provides an outstanding mix of policy theories, described in clear and accessible terms, with up-to-date and engaging examples from across the world that illustrate the application of those theories. Frequent activities throughout the book provide openings for greater student engagement in the subject matter. It's a great resource for teaching. "Sara Bennett, Associate Professor, Johns Hopkins School of Public Health, USA"This book is an excellent teaching tool on policy making in the field of public health. One of the key strengths is to highlight the political nature of health policy making, not presenting it as a technocratic process, but very much part of power dynamics at the local, national and global level. "Chantal Blouin, Associate Director, Centre for Trade Policy and Law, Carleton University/University of Ottawa, Canada"A great introduction and reference for health policy students, offering clear and concise explication of key theories about policy-making and applied to the health sector.